Carbon dioxide: When coal, oil, and natural gas are burned they release carbon dioxide. Carbon dioxide is toxic and causes serious health problems. Carbon monoxide: Burning gasoline, oil, and wood releases carbon monoxide, a gas that causes fatigue and slows the delivery of oxygen. Chlorofluorocarbons: Chlorofluorocarbons or CFC’s are used for refrigeration, air conditioners, and other products. If the CFC’s get released into the air, they can cause the stratospheric layer to thin. Hazardous air pollutants: Chemical plants, dry cleaners, printing plants, and motor vehicles all release hazardous air pollutants. HAP’s can lead to cancer, birth defects, nervous system problems, and deaths. Lead: Lead is a metal that can be found in old homes, old plumbing, and other consumer products. Lead causes severe health problems, and is significant in damaging the nervous system and learning disabilities of young children. Nitrogen oxides: Burning certain fossil fuels release nitrogen oxides. Combined with VOC’s cause respiratory problems. Ozone: Ozone cause lung infections when released by motor vehicles, industries, burning coal, gasoline, and other fossil fuels, and in the chemicals that are in hairspray and paints. Particulate matter: Cars, trucks, and buses burn diesel fuel, fertilizers, and pesticides, as well as road construction, steel making, mining, and turning on fire places and wood stoves, release particles of pollution called particulate matter. When inhaled, and mixed with air particles, PM’s cause respiratory disease and lung damage. Sulfur dioxides: Sulfur dioxides is harmful to vegetation, metals, and causes lung damage and breathing problems. Sulfur dioxides are released into the air from melting metal and by burning paper products and coal. Volatile organic compounds: When gasoline, wood, coal, or natural gas, solvents, paints, and glues are burned they release volatile organic compounds, or VOC’s. 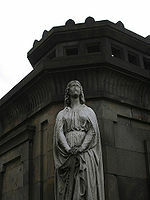 The The effects of acid rain and weathering on monument in the glasgow "Necropolis". Acid rain is extremely harmful to the environment. Acid rain gets absorbed into nearby lakes , plants, and masonry as gases. Since acid rain can take both dry and wet forms, it poses a threat to both land and sea life. Forests: Acid rain, fog, and vapor all contribute to damaging the world’s forests. The acid is absorbed into the trees by the damages caused to the waxy outer coating of the leaves, and the needles. This causes the gas takes the place of water and photosynthesis is unable to take place. The surrounding soilabsorbs the acid, affecting the chemical balance, robbing the soil of its nutrition, and leaving aluminum in its place. Many toxic metals, including zinc, copper, and chromium, are released into the forest when acid rain falls. When this happens the growth of many mosses, algae, fungi, and trees is undersized. Sea Life: The worst effects of acid rain are seen in the water. The minerals that are leeched from the forest soil find their way into nearby lakes and rivers. The pH level needs to stay in the neutral area of 7 on the scale. If the number drops below 7, the more acidic substance there is in the water. Fish need water to breath, and when the acidic level in the water goes below 4.5 on pH scale, all of the sea life dies. Fish also suffer from intense gill damage and disturbs the surrounding plant life. Any aquatic plants and animals, insects, and bottom dwelling decomposers will also be affected by acid rain. In the 1980’s at least 202 lakes were studied for acidic levels, and only 33% of the lakes have become less acidic. Humans: Humans are also affected by acid rain. Acid deposits come in contact with people’s every day lives. Food, drinks, the very air we breathe, all have been in contact with some form of acid rain. More health problems occur the more acid rain becomes a problem. Children and adults with asthma or other respiratory problems have been linked with acid air pollution. Health problems in the United States and Canada include: 550 premature deaths, 1,520 emergency room visits, and 210,070 asthma symptom days. Non-living Objects: Acid rain can do severe damage to some of the nation’s most memorable monuments. Buildings, statues, and sculptures are all targets of acid rain. ↑ Acid Rain unknown Author, unknown Publisher, February 15, 2011. ↑ Acid Rain - Causes, Effects, and Solutions unknown Author, unknown Publisher, February 15, 2011. ↑ Acid Rain ThinkQuest Team, unknown, January 28, 2011. ↑ Acid Snow David R. Cook, unknown Publisher, February 15, 2011. ↑ cid-fog1 acid fog - AMS Glossary unknown Author, unknown Publisher, February 15, 2011. ↑ Acid Mist unknown Author, unknown Publisher, February 15, 2011. ↑ What is Acid Gas unknown Author, unknown Publisher, February 15, 2011. ↑ Define Acid dust unknown Author, unknown Publisher, February 15, 2011. ↑  ThinkQuest Team, unknown, January 25, 2011. ↑ Cox, Porch, and Wetzel. Chemistry for Christian Schools. South Carolina: Bob Jones University Press, 2000. (p.395). This page was last modified on 23 April 2015, at 15:45.